Planning for Bristol Pride 2013 is well underway as we gear up to be one of the largest Pride events in the country. The week-long festival will kick off on Saturday 6th of July and see a week of events ranging from comedy, theatre, film, sports and dance as well as collaborations with St Paul’s Carnival and the Bristol Shakespeare Festival. There’s even a sing along Mamma Mia! event planned with the films screenplay writer Catherine Johnson. Pride Day will be on Saturday 13th July and will once again see a massive outdoor cultural music and arts festival in the heart of the city centre, along with a takeover of the O2 Academy for the official After Party fundraiser. 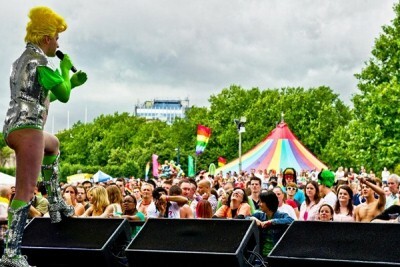 Over 20,000 people attended Bristol Pride in 2012 with a week of sell out events attracting supporters and party goers from all over the UK and overseas. With high-profile support from celebrities such as Stephen Fry, Graham Norton, Matt Lucas and Catherine Johnson Bristol Pride is a bold celebration of the lesbian, gay, bisexual and transgender (LGBT) community across the South West, but its reach extends much further. The fight for equal rights is far from over and every year the festival twins with an international Pride event to highlight the global fight for equality. WE ARE: PROUD is a chance for LGBT people, their friends, families and the whole of the South West to stand up and declare they are proud of who they are and their loved ones and in turn influence gay rights on the world stage, by maintaining a proud and visible presence and standing up for LGBT rights internationally.